There’s a lot of gray area when it comes to schools and students' use of social media. Lawmakers in North Carolina and several other states are trying to clear up one aspect of it. Take this example from 2011. A principal in Minnesota gets a complaint from a parent that a middle-school student is talking about something of a sexual nature on Facebook with her son. That principal asks the student to handover her password to that account. She does and watches while three school officials go through her public and private messages. North Carolina State Representative Duane Hall of Wake County wants to prevent schools and universities from doing that. “We have a fundamental right to privacy, but I’m afraid we haven’t been able to keep up with this in the digital age,” says Hall. 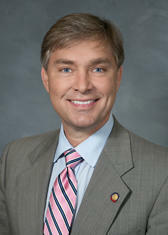 NC State Representative Duane Hall plans to introduce another bill to protect student online privacy. Lawmakers in several states are pushing legislation to prohibit schools from asking or forcing students to give up their passwords in most circumstances. The same would go for employers. In 2013, a similar bill Hall sponsored passed the House with bi-partisan support, but never made it to the Senate. The ACLU in North Carolina hasn’t received a lot of complaints locally about schools forcing kids to do this. “One of the things we’re hoping to do is to head off this kind of activity by school administrators with some clear state law,” says the group’s director Sarah Preston. Charlotte Mecklenburg Schools doesn’t have a policy guiding whether school officials can ask students for social media passwords. UNC Charlotte requires athletes on Facebook to friend the athletics compliance office and allow the office to follow their Twitter accounts. The university says that’s to make sure the athletes meet any NCAA expectations regarding behavior. The 2013 bill would not let schools make that requirement. But UNC Charlotte points out it’s not a condition of attendance, but rather of participation on a team. In the Minnesota case, the student ended up suing, saying the school’s demand violated her first amendment rights and made for an unlawful search. In 2014, the district settled with the student for $70,000.